Ever in pursuit of superiority, the $500 million investment in Emirates wine list ensures the Gulf airline is always at the top of its game. Its now 12-year old wine programme allows guests to enjoy a glass of Dom Pérignon on any Emirates flight in the premium cabins. In Emirates First Class, it isn’t uncommon to be served a red that hails from the prestigious wine-making region of Bordeaux in France. To give you just a snapshot of the lengths Emirates goes to offer its high-end passengers the best wine list in the sky, Senior Vice President Inflight Catering, Joost Heymeijer, told Bloomberg that there are typically 70 different types of wine circulating across the airline’s network at any point. This means customers sample an impressive rotating list of over 300 world-class vintages in a year. This is possible because Emirates, of course, owns a group of wine storage warehouses in Burgundy. Here, in a ‘Fort-Knox style facility’ with temperature and light controlled spaces, some 3.75 million bottles are preserved and protected in their original packaging, in boxes or palettes until they are deemed ready to serve. President of the airline, Sir Tim Clark, explained that for the airline, ‘wine is an experience’, buying ‘en primeur’ up to a decade before they are ready to be consumed. On-board, Emirates’ wine list is curated based on the flight path and what vintage might be ‘drinking best at that particular time’. 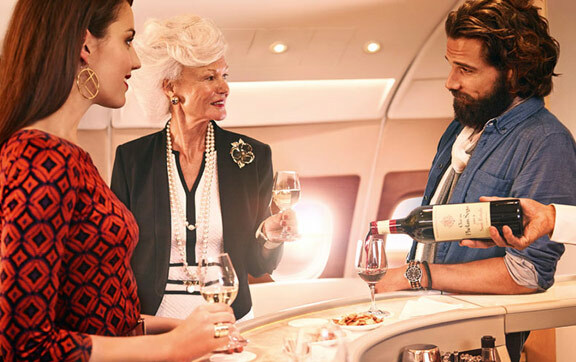 Wine certainly is an experience for Emirates, as Clark explains that customers don’t just want to drink the wine; they want to feel as though they are dining in the best restaurant. He elaborates that guests are interested in everything to do with what they are putting in their mouths, including the origin of the grape, the vintage and the background story of the winery. This is why the carrier has invested in the experience of the Emirates wine list by buying smartly in the past decades. Buying in smaller quantities means securing the best vintages, whilst buying heavily in good vintage years that are lesser known and then waiting for them to come of age provides guests with the opportunity to try the best vintages. 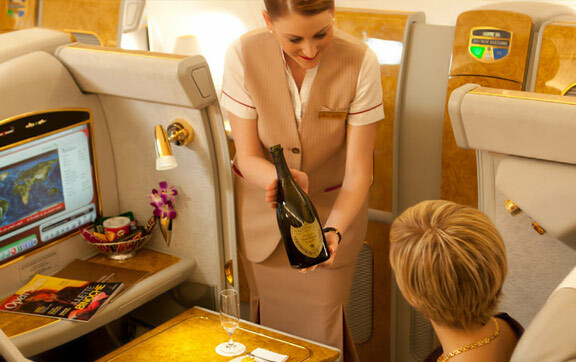 It’s a big investment, anyone would agree, but the airline asserts that wine and champagne will always be an important part of the Emirates offering and so it’s a venture that it will always invest richly in. To illustrate, the president of the airline sustains that as surely as they know the projected size of their fleet and the destination of each aircraft, the team know what wine will be offered in what class and on which flight years ahead of time. Buy today, serve years later: it’s a winning formula. It’s all good and well attaining good vintages of wine, but serving it at 30,000 feet or more and maintaining its quality is another. It is for this reason that careful steps have been taken to ensure the integrity of the wine on-board by decanting them into personal carafes rather than straight out of the bottle, to help air out the wine and compensate for the dryness in the cabin. Champagne is served in larger glasses instead of the traditional fluted glasses, as are the reds and whites, giving the recipient a more generous serve than the standard glass. To make room for such items, the aircraft galleys have been modified to fit the larger glasses. More importantly, the cabin conditions are maintained in a way as to further preserve the quality of the precious liquids while in the sky. The humidity and air pressure within are kept at an altitude of about 4,000 – 8,000 feet so as to emulate the same altitude as that of the ‘Swiss Alps’. Doing the wine justice also means employing and training the right team; from the tasters, traders, contacts, and sommeliers (of which some can be found on-board on selected flights). Such measures also lend credibility to Emirates as a good buyer of wine and one who does justice to the winery. From its warehouses in Burgundy, to Bordeaux, and locations all over the globe, you can now taste some of the finest that the world of oenology has to offer on an Emirates flight. Old World and New World wines collide with flavours from Italy, Napa Valley and Australia appearing on the specially curated Emirates Wine List. Indeed, where else can you sample wine that can retail for more than $2000 a bottle? 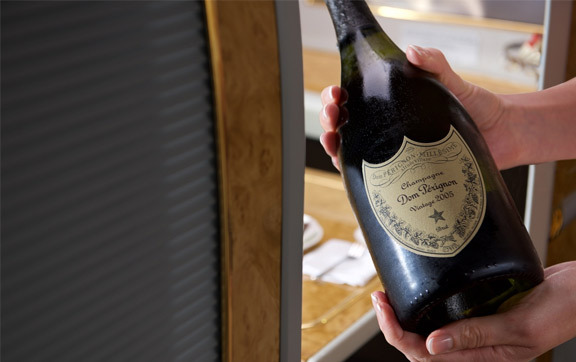 Emirates is the only airline in the world for which the Dom Perignon 2006 was exclusively bottled for by LVMH. Beyond the wine, Emirates is also the only carrier in the world to offer an $800 a bottle Henessy Paradis cognac to its first class passengers and even offer it at the self-serve bar to pour at one’s leisure. Just recently, Emirates unveiled the Dom Perignon 2005 which will soon be served to customers in First Class. Exclusive rights have been given to the Gulf carrier to serve the 2005 vintage, demonstrating the length and strength of the relationship forged between the airline and the Champagne house. On a flight from Melbourne or Sydney, in Emirates First Class you can expect the Dom Perignon 2006, Pierro Chardonnay 2013, 2005 Château Gruaud and Graham’s 1972 Tawny Port. Whilst Business Class passengers can enjoy Michel Laroche’s 2013 La Chantrerie and Château Lynch-Moussas 2005 Pauillac. The Emirates wine list is updated every month on all routes. The Emirates website lets you view the wine list on your flight. I flew from Dubai to Melbourne in Business on Sunday 1st April/Monday 2nd. The red Bordeaux was excellent. I forgot to make note of the name, can you please let me know? Hi Roger, thank you for your comment. I have had a quick look at the wines served on the Melbourne to Dubai route. Would you be referring to the Chateau de Forbel 2010? Owned by Alain Vaulthier of the exalted Premier Grand Cru Classé Chateau Ausone, this property is close to both Ausone and the picturesque village of Saint Emilion. Although mainly Merlot and Cabernet Sauvignon, 7% of the wine is Petit Verdot and 3% is Carménère, representing close to the largest inclusions of either grape by any property in Bordeaux. 2010 was an exceptional vintage, and the nose presents notes of cedar, roasted herbs, lavender, black cherries and spice. The wine is medium-bodied on the palate with freshness, precision, well integrated tannin and persistent mineral-toned briar and blackberry flavours. Match with roasted poultry, grilled steak and aged cheese. If this is not correct please view a complete list of wines that were served on this route. Are you a frequent traveler for Business or leisure? If so I would be happy to assist with any future travel requirements.